Chris’s blog: Hard Times or Great Expectations? The winter light is retreating from Quarry Field, cold, crisp and even. Why look everyone, look through the frosty cabin window, we can just make out the hunched figure of the manager, fingerless mitts and writing away by candlelight (the generator run out of fuel, again). Well (surprisingly long sigh) another year almost over, I don’t want to sound all Charlie Dickens but it’s not easy you know! This year the boys, who flew the nest, found the road to desistance bumpy and even the strongest wobbled. Earlier in the year, dark forces conspired, exerting pressure on our boys to smuggle contraband back into jail. How? Well I leave that to your imagination but there aren’t many hidey-holes on the human body. Rest assured, we stamped it all out, firmly. Our future always so uncertain, money is hard won and we try to do so much on very little. If only some kind of Christmas intervention could help us (another long sigh). There is a sharp knock on the cabin door; a strange figure covered in brightly coloured numbered balls, drags our somewhat surprised manager outside. Whoosh…in a most extraordinary spectacle, the manager and the Ghost of LandWorks Past, Present and Future rocket into the night sky…The manager last heard muttering something about elf n’safety. Together they fly out over the South Hams to see our community, trainees, graduates and their families. 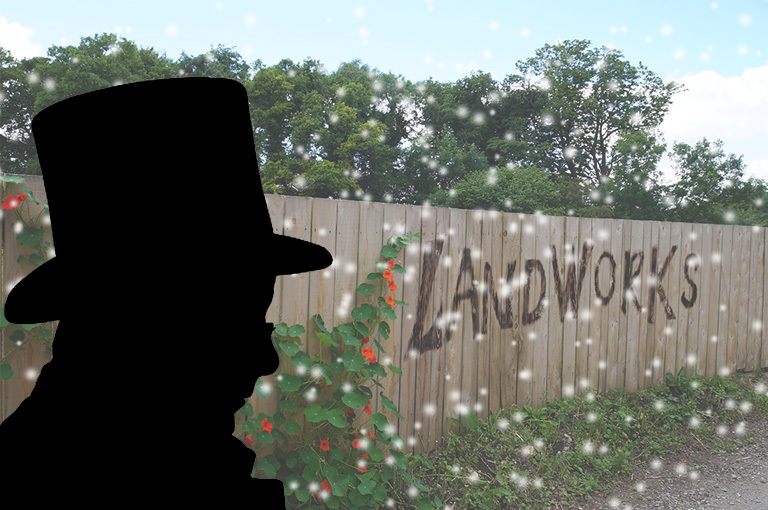 LandWorks simply could not exist without your tremendous support and belief in what we are trying to do. You actively engage with the project, our trainees and support us in many forms, from lunchtime to finance. It is this community engagement that has supported our application to The Big Lottery fund, combined with our recent outcomes and positive evaluation… The Big Lottery has just announced that they will fund 60% of our budget, for three years. This time next year…I will be writing to you from a bespoke building, built by our trainees, with electric light, funded by the Lottery and supported by all of you. This is truly fantastic news; this grant means we are here for years ahead (remember I’ve glimpsed the future!). We simply could not help these men and their families without your involvement and your desire to help make a difference to their lives, now and in the future. Thank you and please don’t go….we are doing this together. Narrator: Our manager locks the cabin, turns, and then dances off through the snow, in absolute delight.